February, 2014 - Event FX Productions, Inc.
United States Navy Veteran and Co Owner of Event FX, Randy Sumey, led the production of nearly 2,000 feet of bunting and red carpet on the new NAVY Warship- the USS Somerset. "As a US Navy Veteran, it was an honor to be back on a NAVY ship but even more so- this was the most meaningful and emotional project we have worked on in all the years we've been in business." 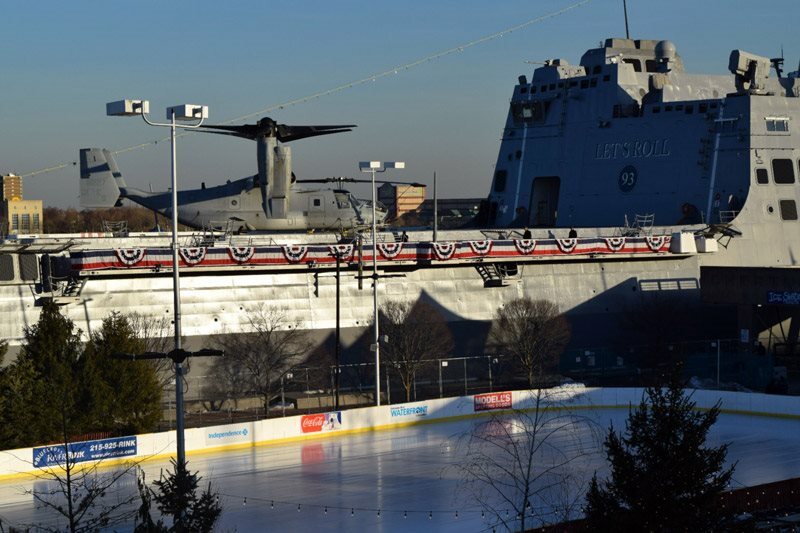 The USS Somerset docked at the Seaport Museum in Philadelphia and was commissioned on March 1st. . The ship is named in honor of the 9/11 victims on Flight 93 whose plane went down in Shanksville, Somerset County, PA . 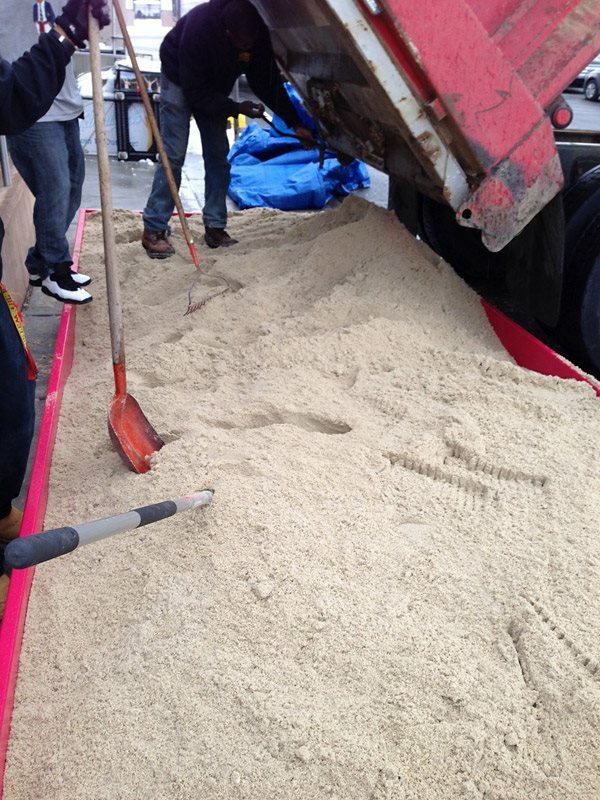 The Somerset's bow stem contains steel that was melted down from a 22- ton "dragline" situated near the crash scene, where an American flag waved during the recovery efforts. 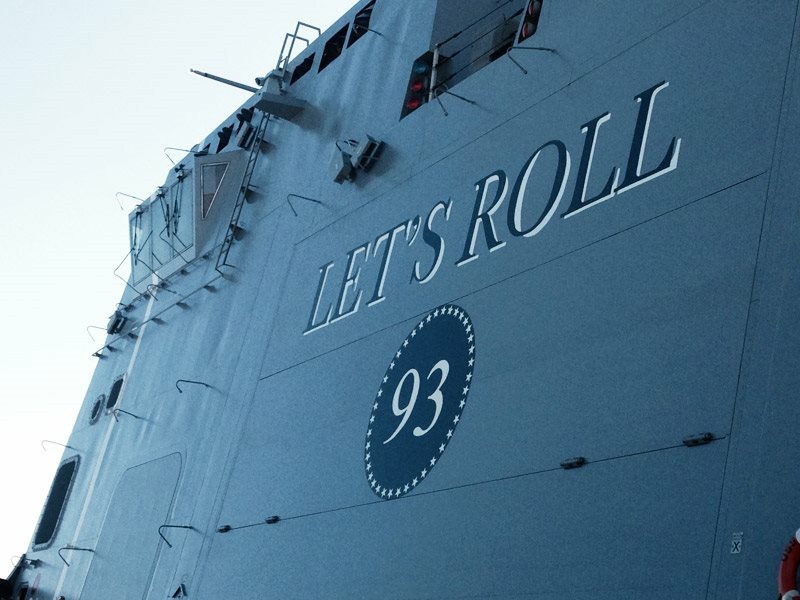 9/11 families were touring the ship and giving tours throughout the installation which really made an impact in what we were doing, especially by the "LETS's ROLL" wall built in memory of Todd Beamers's last words before the plane went down. "It's special when we can work on projects that allow us to have a greater purpose - it wasn't just about bunting and red carpet to us -it was about helping families remember their loved ones and helping people to NEVER FORGET what they did that day-"
Romance was in the air Valentines Day weekend when 3 lucky bachelors found a Bernie Robbins Diamond ring inside a treasure chest buried in the sand. 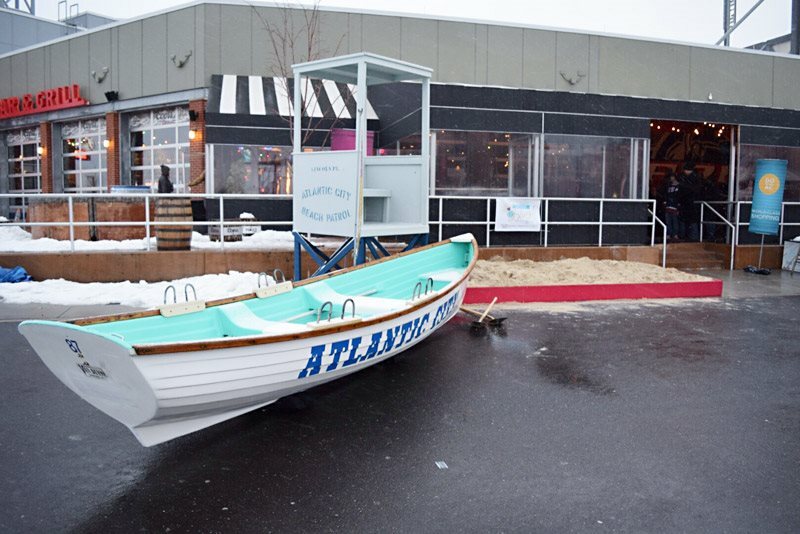 Event FX set the stage for a DOAC event with a real Atlantic City life boat and lifeguard stand and a 15' sandbox filled with over 6 tons of sand and buried (6) treasure chests, 3 of which contained real diamond rings provided by Bernie Robbins Jewelers. 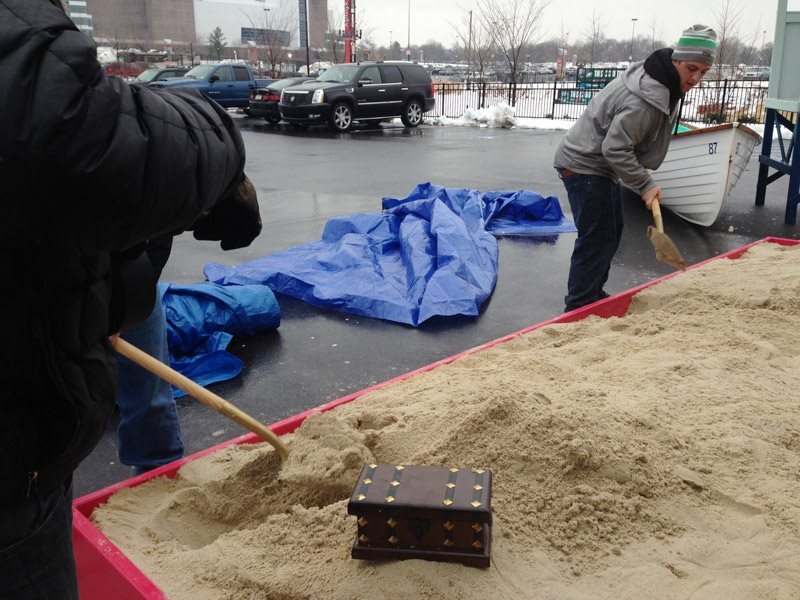 After winning a contest on 97.5, 6 winners were selected, were blindfolded on their knees, and dug through the sand with their hands to find the buried treasures. The three winners proposed to their lovely ladies on the spot and all said YES. 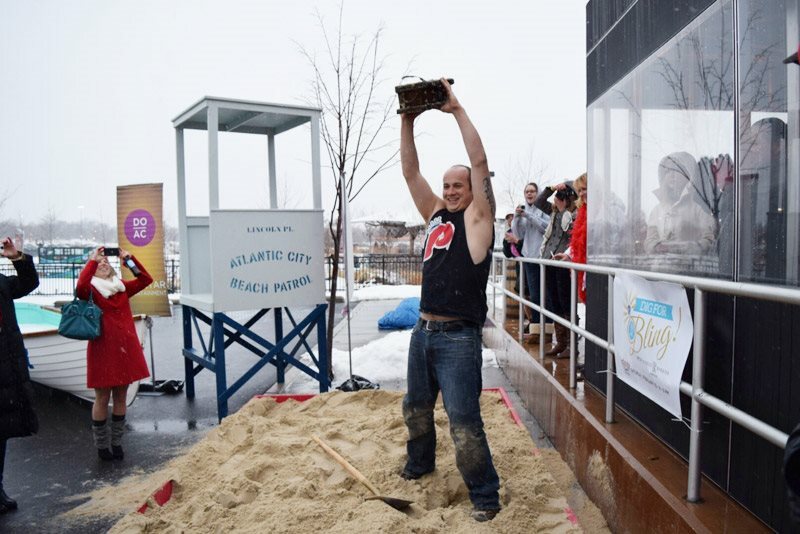 Choose Atlantic City to host your next event. Beautiful beaches and outstanding venues couldn't be closer to home.